The first reports on the application of microwaves in organic synthesis date back to 1986, but it was not until the recent introduction of specifically designed and constructed equipment, which countered the safety and reproducibility concerns, that synthetic application of microwaves has become established as a laboratory technique. Microwave assisted synthesis is now being adopted in many industrial and academic laboratories to take advantage of the novel chemistry that can be carried out using a variety of organic reaction types. 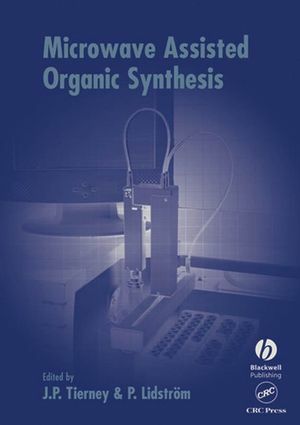 This book demonstrates the underlying principles of microwave dielectric heating and, by reference to a range of organic reaction types, it’s effective use in synthetic organic chemistry. To illustrate the impact microwave assisted organic synthesis can have on chemical research, case studies drawn mainly from the pharmaceutical industry are presented. Jason Tierney is a Team Leader in the High Throughput Chemistry Department at GlaxoSmithKline, Harlow, UK, and Pelle Lidström is Product Manager – Synthesis at Biotage AB, Uppsala, Sweden. Theoretical aspects of microwave dielectric heating, D. Michael P. Mingos. Microwave Accelerated Metal Catalysis. Organic Transformations at Warp Speed, Kristofer Olofsson and Mats Larhed. Heterocyclic chemistry using microwave-assisted approaches, Thierry Besson and Christopher T. Brain. Microwave-assisted Reductions, Timothy N. Danks and Gabriele Wagner. Speed and efficiency in the production of diverse structures: Microwave-assisted multicomponent reactions, Jacob Westman. Integrating Microwave Assisted Synthesis and Solid-Supported Reagents, I.R. Baxendale, A.-L. Lee and S. V. Ley. Microwave-Assisted Solid-Phase Synthesis, Alexander Stadler and C. Oliver Kappe. Time-Savings Associated with Microwave-Assisted Synthesis: A Quantitative Approach, Christopher R. Sarko. "Overall, this is a well-written, concise book on this fledgling but fast growing field of microwave-assisted organic synthesis. The book does a good job of showcasing the enormous potential (waiting to be harnessed) of microwave-assisted synthesis ... The book is replete with many good examples of the reactions to which microwave heating has been successfully applied, and the chapters are well referenced ... It will be an important addition to the few books on this relatively new aspect of modern organic synthesis. Students of organic chemistry should find it useful as well."